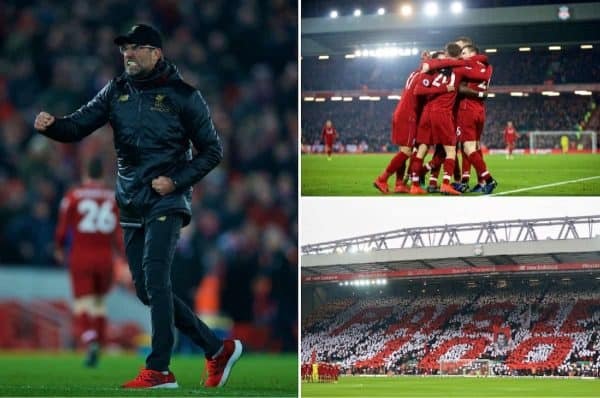 Liverpool secured their 19th Premier League win of the season and went seven points clear at the top as they beat Crystal Palace 4-3 in dramatic fashion. With the Reds’ sole focus for the next month firmly fixed on the league, they welcomed Palace to Anfield for their first home game of 2019. It was a chance for Jurgen Klopp‘s men to put the pressure back onto Man City, picking up points against the Eagles where the Manchester club failed to do so. Prior to kickoff there was a minute’s applause for what would have been Sir Bob Paisley’s 100th birthday. The Liverpool manager is arguably the most successful in the club’s history. The Kop marked the occasion with a fabulous mosaic as Paisley’s family watched on from the stands. With Palace already showing their ability at the Etihad in December, Liverpool knew it would be a close game—however, in the end no one could have predicted the 96 minutes that unfolded at Anfield. Klopp make three changes from the side that beat Brighton at the Amex. James Milner came in at right-back, replacing an injured Trent Alexander-Arnold. Naby Keita took up the role recently played by Gini Wijnaldum. Joel Matip returned to partner Virgil van Dijk at centre-back, with Fabinho joining Jordan Henderson in a midfield two. As the half wore on it was Andy Robertson who looked the most dangerous attacker—the full-back was full of energy once again. Palace, for their part, were happy to hand over possession of the ball to Liverpool—looking to hit the Reds on the break, and that is exactly what happened just after the half-hour mark. Andros Townsend latched onto a dangerous cross by Wilfried Zaha after a wonderful counter-attack; it was against the run of play but the Eagles stunned Anfield with the opening goal. 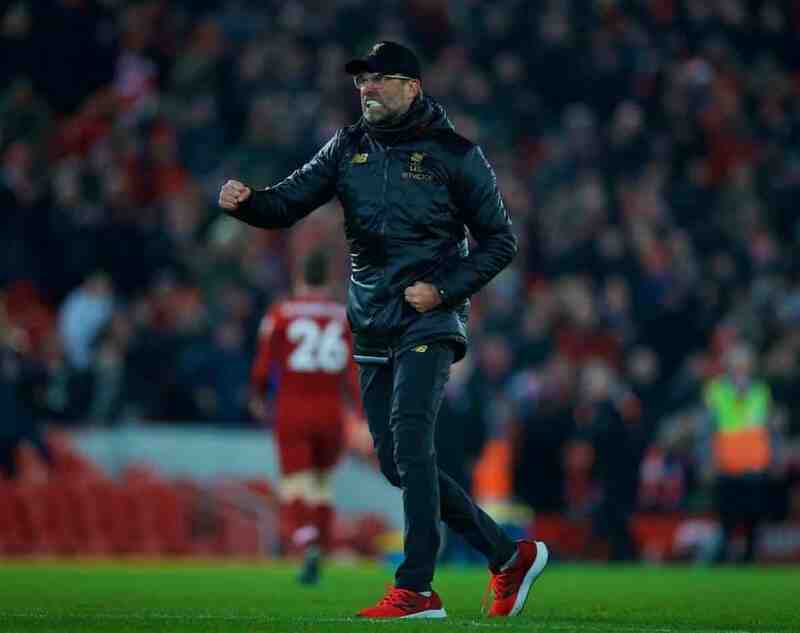 Liverpool came out for the second half with all the hallmarks of a team who received a rollicking during the break, Klopp had fired up his side. With the half barely 60 seconds old Mohammed Salah pulled the Reds level. A deflected shot by Virgil van Dijk looped into the air and Palace ‘keeper Julian Speroni failed to react. The veteran shot-stopper was caught in no man’s land and Salah flicked the ball into the net. Five minutes later and Liverpool took the lead, Roberto Firmino fired his shot into the bottom corner after a pinpoint pass from Keita. Klopp wanted a response and he got one, the Reds had turned the game on its head in a matter of moments. Palace weren’t done though, and some sloppy marking by Liverpool allowed James Tomkins to head home from a corner. After all their hard work it was an error that saw Liverpool’s lead slip away. Speroni then handed Salah his second of the match with another mistake. The Palace ‘keeper tried to tip the ball over the crossbar following a cross by James Milner, but the Argentine got it all wrong and Liverpool’s top scorer was on hand to punish the Eagles yet again. Three became four in the 93rd minute as Sadio Mane raced onto a Robertson through ball. The Senegalese forward made no mistake and the Kop went wild. But, as seen previously the south London club still had something to say in this fixture. Max Meyer had Reds biting their nails as he added Palace’s third in the 95th minute. The Reds clung on for the final moments of the game, it may have not been the best performance by Liverpool this season but they had crucially picked up all three points. Klopp showed just what it meant to him at the final whistle. Liverpool now travel to Dubai for a winter training camp. A rest period of 10 days will allow the Reds to regroup and focus on a set of fixtures that includes a double-header against Bayern Munich in the Champions League.